All our rooms share a special and careful touch. Every detail defines our unique and contemporary style. From the finishes on the walls to the carefully selected handmade pieces by local artisans. All rooms offer a comfortable stay, each one has something that defines it, spacious and relaxing shower, all with a beautiful living room and beautiful spaces, ideal to rest from your long trip. Our concept is based on contemporary trends in combination with the rich Oaxacan culture that keeps every corner of our hotel simple and unique. Located in one of the corners of the hotel a beautiful decoration that is complemented by the colonial style and the beautiful window that offers a view of one of the main streets of our city and great natural light. It is one of our largest, most comfortable rooms. Ideal for that perfect getaway with your family or friends. It is a complete room, with free WiFi, cable TV, air conditioning, a spacious bathroom and a lovely living room. Sit down with confidence and relax in this beautiful cozy room. The white walls and the minimalist style in every detail give the sensation of spaciousness and serenity. The wooden furniture makes a perfect balance with the neutral tones of the other decorative elements, highlighting the beauty of one of the handmade rugs that we acquired with artists from Teotitlán del Valle, Oaxaca. When you enter the Junior Suite you just want to settle in and try the comfort of the bed, sit in one of the beautiful wicker chairs and watch TV. The room has an interior patio that provides daylighting and fresh air. If you like to write, take your time, spend time on the computer, or come to a business trip, you will have good use of the large desk that matches another exclusive piece, a rug made in Teotitlán del Valle. Drop your bags and settle in one of our favorite rooms that shares a wall with the San Pablo Cultural Center, the iconic site of the City. So if you are a lover of history and culture you will love knowing that the quarry walls of the building are kept in good condition and you can see it in the interior terrace of the room. 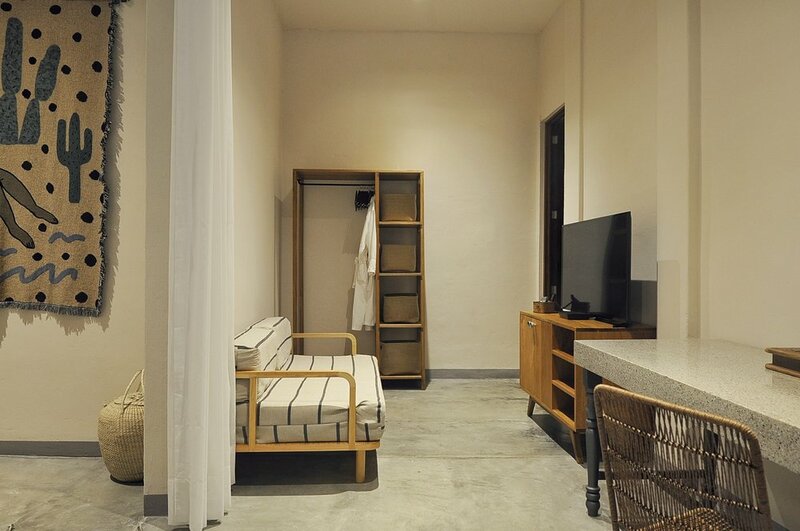 The room has a natural and fresh design, a very spacious bathroom ideal for taking a shower and relaxing. Enjoy the privacy and tranquility of this room. One of the most spacious with internal patio. This charming suite is equipped with 2 queen beds perfect when traveling with your family or friends. It has a spacious shower and a living room with great lighting. 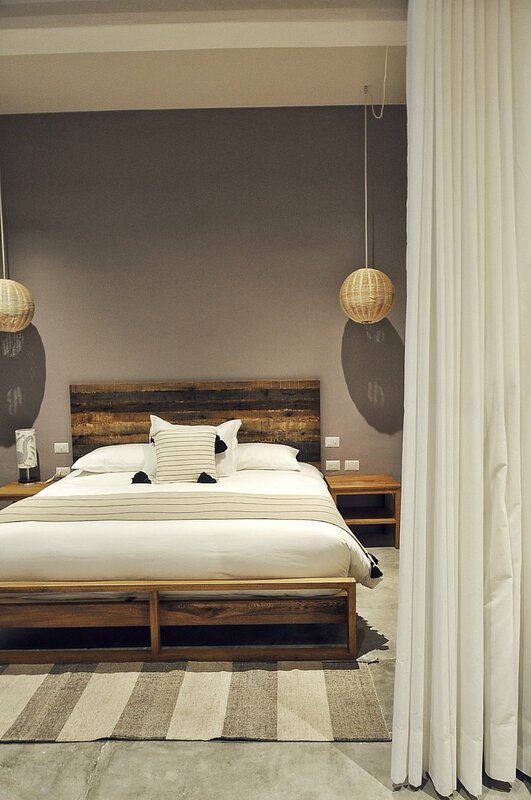 You will sleep in a space that preserves the colonial essence of most Oaxacan homes. You will sleep like at home. Room six is located on one of the sides of our central patio, which makes the light enter through the large window, it has a cozy warm atmosphere. The simple design and distribution of the decorative elements offer the guest an atmosphere of peace and tranquility. Like our other rooms, it has a super-spacious bathroom with natural finishings on the walls, where you can take a relaxing shower before heading out to tour the streets of Oaxaca.